Customers check out some free samples from Christophe's Crepes, one of the 28 food trucks that will be part of the Friends of the Fairfield Public Library Food Truck Festival Sept. 30 at Jennings Beach. 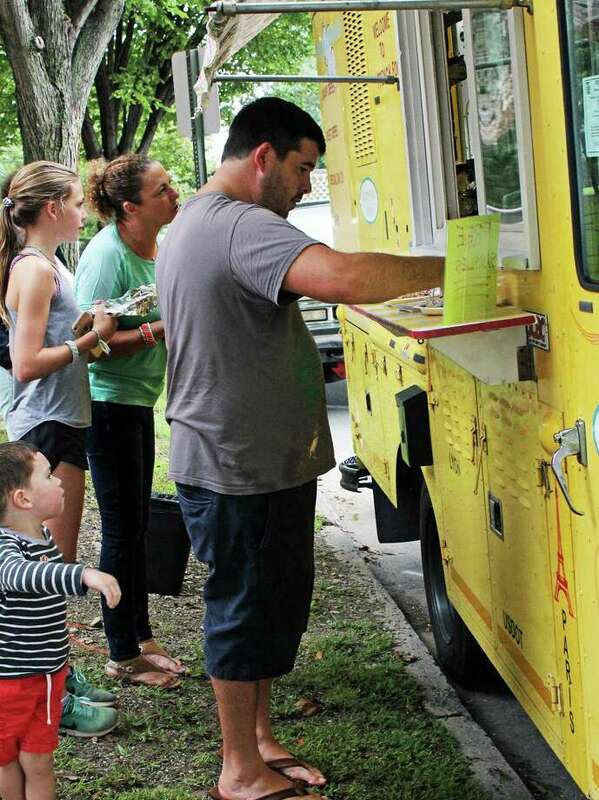 FAIRFIELD — The answer to the question “What’s for dinner?” should be easy on Sept. 30 when the Friends of the Fairfield Public Library host their second annual Food Truck Festival. Last year’s event drew about 4,000 people — twice what was expected — forcing organizers to switch to hand stamps when they ran out of wristbands. The turnout was so high that when some attendees got up to the window of their chosen food truck, all the food was gone. The Friends are hoping attendance remains high while food remains abundant, and have increased the number and variety of food trucks. This year, there will be 28 trucks participating, selling everything from coffee to crepes, and hot dogs to Asian Pacific cuisine. Admission to the food truck festival, which will take place from noon to 6 p.m. at the Jennings Beach parking lot, is $5, with children 12 and under free. All of the admission proceeds go to help fund library initiatives. Last year’s $17,000 was used to upgrade the library’s mobile computer lab. All of the food trucks will charge their usual prices, and there will be performances by a cappella groups from Fairfield public schools. For the youngsters, there will be face-painting and story times. For those who don’t want to wait in line for a wrist band, they will be sold in the lobby of the library, 1080 Old Post Road, in the days leading up to the festival. Sunday, Sept. 30, noon to 6 p.m.
Thursday Sept. 20, 5 to 7 p.m.
Monday Sept. 24, 11 a.m. to 1 p.m.
Thursday Sept. 27, 5 to 7 p.m.